SEE tomorrow's Morning Bulletin for more from the forum and what Prime Minister Kevin Rudd and other Federal ministers got up to in Rockhampton. 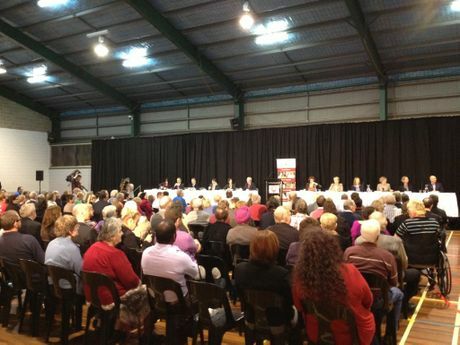 8pm: PREMIER Campbell Newman has come under attack several times throughout the forum. Prime Minister Kevin Rudd called upon the premier to "stop the slash and burn" of jobs. 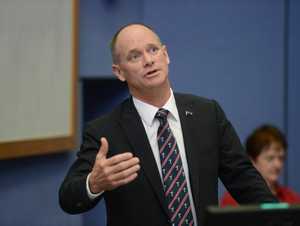 He described the sacking of thousands of public servants as the "Campbell Newman austerity drive" to applause from the Rockhampton crowd. Mr Rudd told a Rockhampton teacher who asked about the progress of the Better Schools reform that he had recently had a "semi-civilised discussion" with Mr Newman about the reform and said he hadn't given up on getting the premier on board. 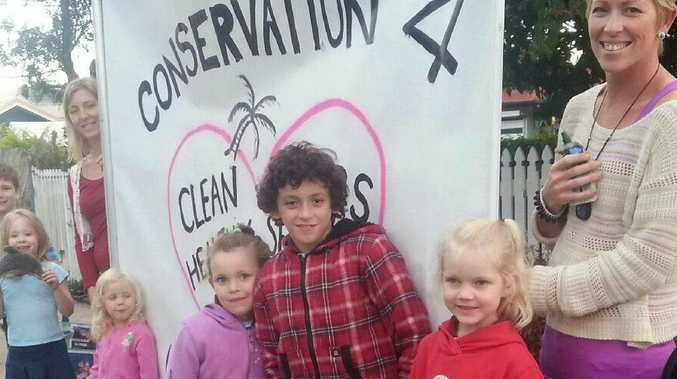 "We're trying to build the houses up, he's trying to tear them down," Mr Rudd said. 7.25pm: Reporter Lisa Benoit says diabetes is a hot topic being debated at the forum. She also reports there is a lot of discussion about the carbon tax being terminated and turned into a floating carbon price. 7.10pm: PRIME Minister Kevin Rudd was reprimanded for not recognising the traditional owners of the region, the Darumbal tribe, when he kicked off the forum. His fellow ministers also received a jab from the first audience member to ask a question for not mentioning the Darumbal tribe when they introduced themselves. Mr Rudd shot back, saying he was the bloke who delivered the national apology to Indigenous Australians and he honoured Indigenous Australians wherever he went. 6.51pm: NORTH Rockhampton State High School would receive $8.1 million in the next six years if Queensland signs on to the Better Schools program, according to Prime Minister Kevin Rudd. Mr Rudd made the announcement to thunderous applause from the Rockhampton audience at the public forum. 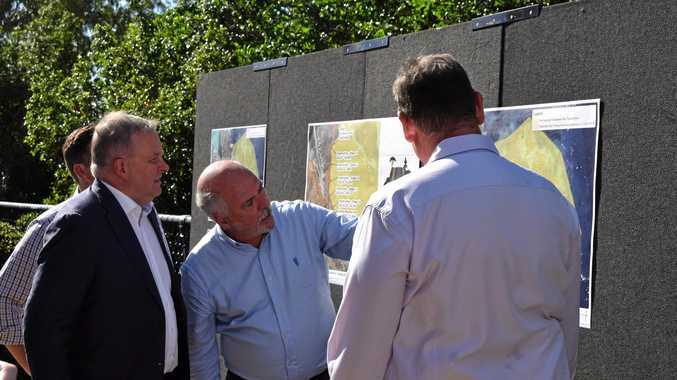 He earlier today urged Premier Campbell Newman to get on board with the program. 6.45pm: PRIME Minister Kevin Rudd says Australia cannot have all of its eggs in one basket - the mining industry. Mr Rudd said the country needs to "diversify the economy". He said Australia needs more competitive energy prices, calling on state governments to take more action regarding electricity prices. 6.37pm: PRIME Minister Kevin Rudd officially announced if elected the Rudd government would match the Coalition's $500,000 funding for the CQ NRL Bid. The money will go towards a feasibility and design plan for a new stadium. 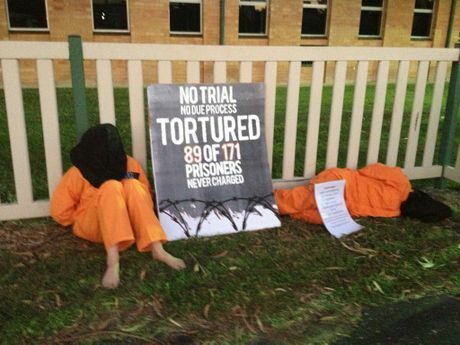 6.30pm: TALISMAN Saber protesters waited outside the North Rockhampton State High School hoping to capture the attention of Prime Minister Kevin Rudd on his way to the Community Cabinet. 6.25pm: Prime Minister Kevin Rudd takes to the stage. 5.40pm: BARRY "the butler" McKenzie, Prime Minister Kevin Rudd's travelling companion, made an appearance at the Gracemere Saleyards just outside Rockhampton this afternoon. The PM was at the saleyards to announce $2.5 million in funding for the next Beef Australia expo when he was asked whether he had a personal assistant carrying around a cushion like a butler for him. Premier Campbell Newman accused Mr Rudd of employing a butler during parliament. Mr Rudd laughed off the question, saying it was true that he had a round lumbar roll cushion for his back, but the duties of carrying it were shared amongst himself and his staff. A media officer tossed the cushion to Mr Rudd and he introduced it to surrounding media as Barry "the butler" McKenzie. "(It's) because I've got a crook back mate," he said. "I think if it's not under my arm, it's being carried by one of my staff." Five of Mr Rudd's staff put up their hands when he asked them who had carried Barry. 5.30pm: Morning Bulletin reporters Emma McBryde, Lisa Benoit, Kerri-Anne Mesner and photographer Sharyn O'Neill are on the ground at the forum. Feel free to have a chat with them while they are covering the event. 11.30am: PRIME Minister Kevin Rudd will beef up his commitment to the cattle industry today by announcing a $2.5 million funding injection for the next Beef Australia expo. Agriculture Minister Joel Fitzgibbon will join Mr Rudd to make the announcement, along with the Community Cabinet to be held at the North Rockhampton State High School late this afternoon. The Rudd government described the expo as the largest and most significant cattle industry event in the country. Beef Australia 2012 attracted 85,000 people, including delegates from more than 35 countries. The government expects the funding will benefit Australians employed in agriculture and meat processing by promoting cattle and industry technology. The next expo will be held in 2015 in Rockhampton from May 4 to 9. The environment and education reforms will also join the cattle industry and agriculture as some of the top issues up for discussion at the meeting.